The world is in a tough place financially and marketers want value for money more than ever before. Budgets are being cut and belts are tightening across the marketing world but this is not too worrying for an online marketer because we know that results can be measured and reported on which makes CEO’s and management smile. How do we determine results for our services? 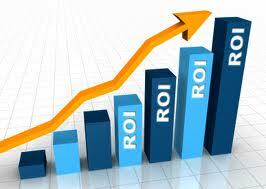 Firstly we offer Pay Per click marketing services which is probably the easiest to measure in terms of ROI. Let’s take Google for example because they are the most popular search engine in South Africa. All of our campaigns are set up to measure a conversion off your website which can be a lead, like filling in a contact us form or it can be a sale if you have an online store. The best way to determine profitability is to chat to the client regarding what value can be placed on a lead. Let us look at an example. A Google AdWords advert for your business may cost R10,000 per year and result in 100 leads. Ten of those leads become clients, and each client provides an average revenue of R1,200. The value of each lead is R120 (R12,000 revenue/100 leads), and your ROI for the Google ad is 20% (R12,000 revenue minus R10,000 spent)/R10,000 advertising cost) x 100. A positive ROI is always one you are striving for but the actual % target should be developed by each business and their marketing agency. Secondly determining ROI for Search Engine Optimisation can be done the same way as Pay Per click but, because your cost of clicks are free, you could substitute that figure with the amount of money you might be paying an SEO company. Another key factor when determining good SEO is by the number of clicks to your website because if these are increasing month on month then you are receiving brand exposure and people might be phoning, emailing directly or coming in to see you and these equate to sales via the online campaign. Thirdly and lastly is how to determine profitability on social media websites. There are lots of articles about using engagement or sharing as a means to establish profitability but we all know it is all about the money so how does that help to prove that social media is working? We would make use of an analytics tool like Google Analytics to check which social media sites are presenting conversions or enquiries and invest more time on this one or a few social media sites. Facebook recently launched its own conversion tracking tool and we’re sure the other social media websites will follow soon. To summarise, determining ROI is not an exact science because you might receive leads through a phone call from someone who saw your advert online.